This week is the start of World Space Week, the worldwide annual celebration of the marvels and mysteries of astronautics, astronomy and all things galactic. And, fittingly enough for the start of a new academic year, the theme is one of exploration! This year’s theme is Exploring New Worlds in Space. From the first race to the South Pole, and first solo flight accross Atlantic, to the opening of a sea route from Europe to the East, exploration and adventures have always defined our very existence as inhabitants of planet Earth. 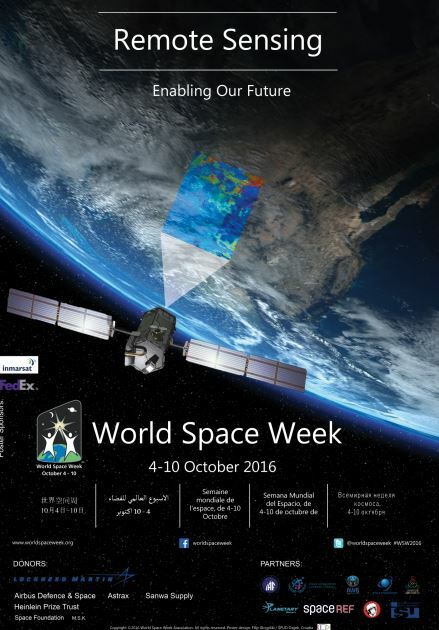 World Space Week celebrations in 2017 will open-up avenues to improve the vast human knowledge and awareness of the clear benefits of space technology and its applications. This will also illustrate that our exploration potential has no end, and that the sky is not the limit for the many wonders of human discovery. This week is the start of World Space Week, the worldwide annual celebration of the marvels and mysteries of astronautics, astronomy and all things cosmic. This year’s theme is “Remote Sensing: Enabling Our Future,” an inward looking theme which celebrates Earth Observation from Space for the betterment of the human race, highlighting a host of classic Earth Observation missions such as the U.S. Landsat mission, the work of intergovernmental groups such as GEOSS Group on Earth Observations and emphasizes applications such as environment and agriculture monitoring, land use mapping and new uses such as location based services. Fittingly, we have access to the National Geophysical Data Centre database, which provides the latest satellite geophysical data from the Sun to the Earth and Earth’s sea floor and solid earth environment, including Earth observations from space, and the NASA Scientific & Technical Information database, which includes up-to-date information about NASA’s satellite projects. We also hold a large number of books about satellite communications & navigation among our collection, along with a good selection of books about space & space exploration in general. 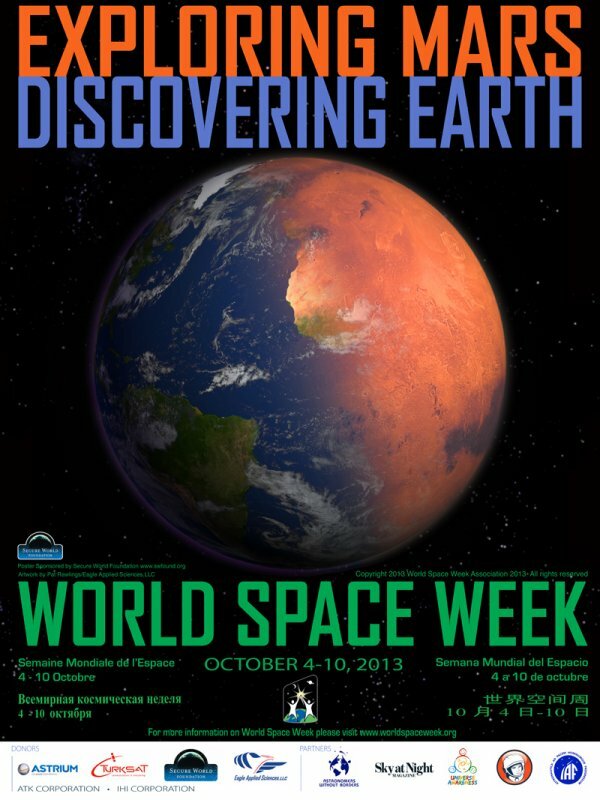 This week is World Space Week, the annual celebration of all things astronautical and cosmic. This year’s theme is particularly suitable – discovery, which highlights the great era of deep space discovery that we are in. We have never learnt as much of the universe we live in as in the last decade. Space telescopes, deep space probes and several interplanetary satellites and landers have shown us the magic, wonders and opportunities of new worlds. 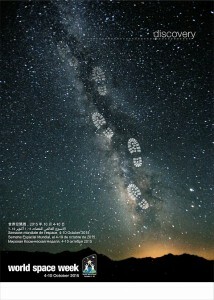 Space is all about discovery! Launched specifically on 4th October by the UN General Assembly to mark the successful launch of Sputnik 1, the first man-made satellite, in 1957, and the signing of the ‘Treaty on Principles Governing the Activities of States in the Exploration and Peaceful Uses of Outer Space, including the Moon and Other Celestial Bodies’ on October 10 1967, World Space Week has been held every year since 1999, and seeks primarily to educate people about the positives of space exploration and encourage better public understanding and support for space programmes. We hold a large number of books about satellite communications & navigation among our collection, along with a good selection of books about space & space exploration in general. We also have access to the National Geophysical Data Centre database, which provides the lastest satellite geophysical data from the Sun to the Earth and Earth’s sea floor and solid earth environment, including Earth observations from space, and the NASA Scientific & Technical Information database, which includes up-to-date information about NASA’s satellite projects. It’s World Space Week, the theme of which this year looks at the importance of Global Navigation Satellite Systems (GNSS) and its importance to modern life on Earth. Imagine a world without navigation satellites to guide planes, ships and cars and not to forget: us with our location based mobile phone applications! And navigation satellites not just accurately pinpoint our position on the planet, it also provides time signals to keep clocks in sync, which is critically important for global trading and many other time critical sectors. We hold a large number of books about satellite communications & navigation among our collection, along with a good selection of books about space and space exploration in general. We also have access to the National Geophysical Data Center database, which provides the lastest satellite geophysical data from the Sun to the Earth and Earth’s sea floor and solid earth environment, including Earth observations from space, and the NASA Scientific & Technical Information database, which includes up-to-date information about NASA’s satellite projects. All this week is National Astronomy Week, and this year the event seeks to celebrate the planet Jupiter, the largest planet in our Solar System, which will reach its highest point in the sky for many years in early March. The event, dubbed “Target Jupiter”, will be running from the 1st -8th March 2014, when organisers hope that it should be possible for astronomers, amateur and professional, to be able take some of the best photos ever taken of the planet above British skies. UK National Astronomy Week is held every few years or so to promote public awareness of astronomy by celebrating remarkable astronomical events. Previous events have marked the return of Halley’s Comet, the closest approach of Mars to Earth for 60,000 years and, most recently, the 400th anniversary of the first astronomical use of the telescope. Stargazers don’t have to look far for books on the subject in the Library, as we have a veritable galaxy of books about astronomy down among our science section on Level 1. Those with a more serious scientific interest than just settling down in the garden with a telescope may also find the NASA Astrophysics Data System database of interest. 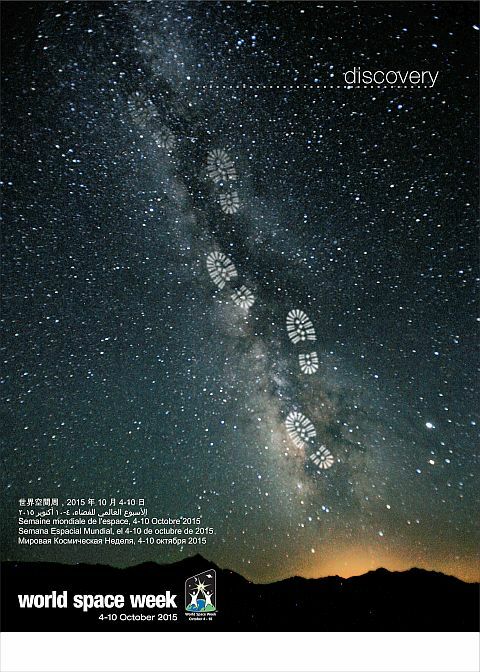 To find out more about National Astronomy Week, visit their website here. 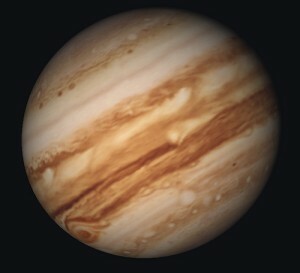 Planet Jupiter image by Tonynetone, reproduced under CC License from Flickr. We all worry about waking up in time for work at some point in our lives, but hopefully none of us will ever be in the position where our alarm clock was primed over two-and-a-half years and there’s a billion Euro mission riding on whether you wake up or not! That’s the situation the European Space Agency’s Rosetta probe is facing, at any rate. Launched ten years ago to study a comet with the less-than-romantic monicker of 67P/Churyumov-Gerasimenko (George Lucas eat your heart out!) the probe aims to catch up with the comet and deliver a lander dubbed Philae to its surface. Once anchored, Philae will scan the comet as it approaches towards the sun, and hopefully deliver images and information that have never been seen before and may prove of incredible value to scientists seeking to find out more about how life is formed in the trackless vacuum of space. Rosetta was put into hibernation in June 2011 when its trajectory took it so far from the Sun – well beyond the orbit of Jupiter – that the necessary sunlight reaching its solar panels was too feeble to provide power. At 10am today, ESA mission control will nervously attempt to wake their sleeping beauty up. You can follow developments as they happen via the ESA website here, as well the full details behind the mission and its background. And if you’re interested in space exploration, don’t forget that we hold a large range of material about space flight and the history of astronautics, including access to NASA’s Scientific & Technical Information (STI) web site among our extensive array of Aeronautical databases. Rosetta Mission Logo copyright European Space Agency. 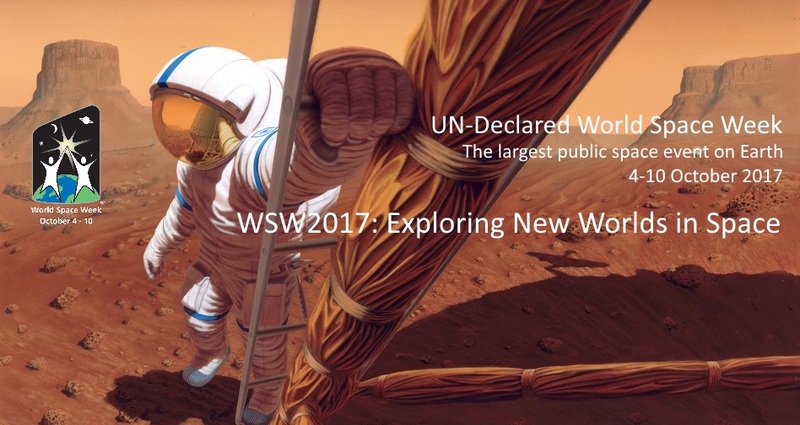 The theme of this year’s annual World Space Week is a world that has long fascinated and inspired scientists and artists alike of every description, the Red Planet Mars. Over the next week there will be a global celebration of mankind’s exploration of Mars, and how by studying our diminutive but intriguing red neighbour we learn more about our own planet. Indeed, the highlight of the week, a world-wide simulation of a manned landing and survey of Mars, will seek to define how to create a world to live in from scratch with only limited natural resources to work from. Launched specifically on this date by the UN General Assembly to mark the succesful launch of Sputnik 1, the first man-made satellite, on October 4th 1957, and the signining of the ‘Treaty on Principles Governing the Activites of States in the Exploration and Peaceful Uses of Outer Space, including the Moon and Other Celestial Bodies’ on October 10 1967, World Space Week has been held every year since 1999, and seeks primarily to educate people about the positives of space exploration and encourage better public understanding and support for space programmes. The Library has quite a range of material about space exploration among our aeronautical engineering section, including several books on the topic of the Red Planet – H.G. Wells seminal alien invasion adventure War of the Worlds among them! We also have access to NASA’s Scientific & Technical Information (STI) web site among our extensive array of Aeronautical databases. 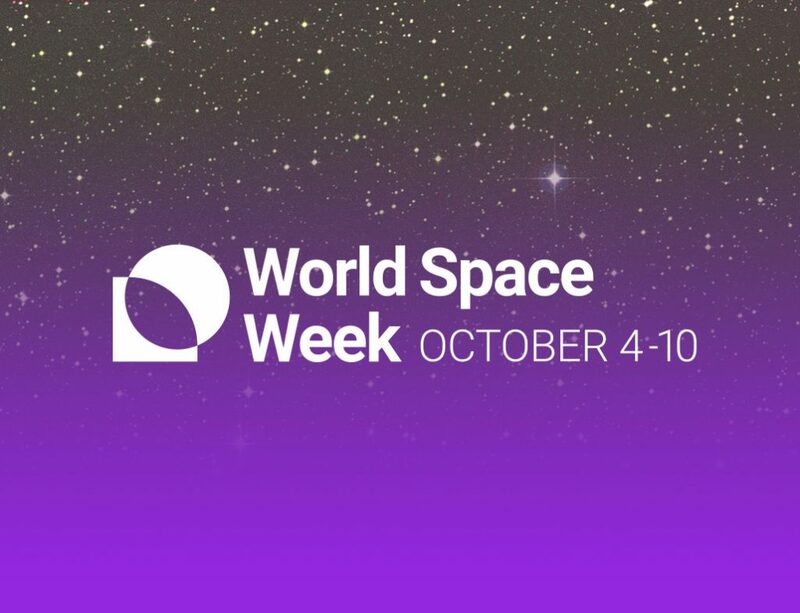 To find out more about World Space Week and the activities that are happening, visit their website here. NASA confirmed this week that its venerable space probe Voyager One has become the first man-made object to leave Earth’s Solar System and enter the infinite realm of interstellar space. 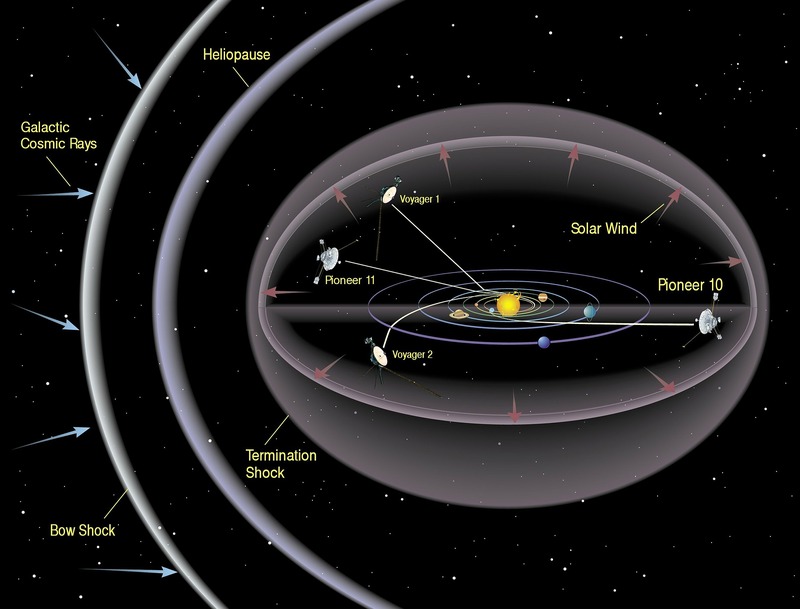 Launched in September 1977 with the original purpose of surveying the far distant outer planets of the Solar System, Voyager One’s systems have kept ticking long after this mission was successfully accomplished – and scientists hopefully estimate that they could on ticking and sending back data until the year 2025 (albeit data that takes 17 hours to reach Earth via Voyager’s radio!). Not at all bad for a device no larger than a family car which has travelled over 12 billion miles through the vacuum of space since its launch! NASA’s website has a page devoted entirely to the Voyager program where you can keep track of exactly how far Voyager One and its sister probe are travelling. Don’t forget that we maintain a large range of material about space flight and the history of astronautics, including access to NASA’s Scientific & Technical Information (STI) web site among our extensive array of Aeronautical databases available on Library Catalogue Plus. Solar System image reproduced from Pixabay under CC License. Space buffs and music buffs alike should be thrilled by a song video with a difference that’s just been posted to YouTube – all the way from the Earth’s orbit! Canadian astronaut Chris Hadfield, the out-going commander of the International Space Station, returns to Earth today and decided to mark the end of his tenure by performing and recording an acoustic cover of David Bowie’s immortal 1969 inter-galactic hit Space Oddity – while floating in zero gravity around his very own ‘tin can’ inside the space station against the backdrop of outer space, 230 miles above the Earth, making it the first ever music video to be filmed in space. Beat that, Major Tom! 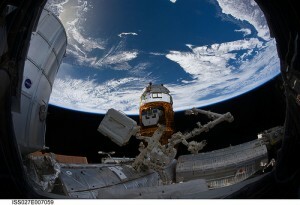 The video marks a triumphant culmination of a six-month tour aboard the station that has seen Hadfield become a global social media superstar through his Twitter account, which he began with the aim of raising awareness and reigniting enthusiasm for space travel, recording every detail of his stay in space backed by some stunning shots of the Earth from orbit. To date he’s amassed over 770,000 followers – doubtless now a few music promoters among them! International Space Station over the Earth, courtesy of NASA’s Marshall Space Flight Centre, reproduced from Flickr under CC License.